PPC (Pay-Per-Click) Marketing is a way of creating and showing your ads to people who are most likely to be interest in your products and services. Different from Organic SEO, with PPC we will generate traffic to your website by advertising directly on the Search Engines Result Pages (SERP). Your ad will appear on the top of all the organic results for specific keywords and key-phrases at cost for each click (or impression) that is received on your ad. We manage our clients’ accounts on a daily basis and monitor bid prices and budgets to ensure that we are maximizing volume and ROI and ultimately achieve our clients' business objectives (leads, sales, visits, etc.). When well targeted and optimized, Pay-Per-Click Marketing (on Search or Display) could be the most efficient and cost-effective way to get targeted traffic on your website. Setup, Analyze & Follow up of your PPC Search Advertising campaigns. Spend money only for the clicks of interested users targeting specific keywords. Target your websites' visitors to turn them into your ‘loyal customers’. Our experienced team of professionals will help you setting up a remarketing list and re-engage users who have already visited your site. You need to generate brand visibility for your products or services? Social Marketing is a great solution to bring targeted and interested users to your site. Display Advertising is very efficient to grow your brand exposure and visibility at a low cost. We can manage to promote your products or services on specific websites related to your niche. Video Advertising is a perfect way to share your vision and interact with your target audience. We can help you creating amazing videos and advertising them thru the best channels engaging all your potential customers. Why PPC Marketing is important for your business? With PPC Marketing you can target your ads by: keywords, location, time, devices and others. You have the flexibility to choose your daily budget and you can pause/stop your campaign any time you want. You will have the opportunity to show your ads to customers when they are searching for a product or service like yours. If you have an appealing copy with a strong call to action your chances of your ad to be clicked will increase. In this way you will have your potential customers in the page you want them to be. Now, in this page you have to inform your visitants the action you want them to perform, and then you can measure if you succeed. We have an extensive knowledge, experience and related certifications to provide first class services and bring a positive ROI to your PPC campaigns quickly. How can we help with your PPC Marketing? Improving existing ads and developing new ones based on models that had better performance. Let us help you get your business online growing and reach a positive ROI quickly. Contact us today about your PPC needs! 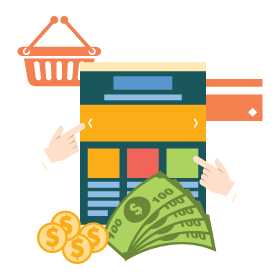 We will create, manage and optimise your accounts as well as all your campaigns (search, display, remarketing, etc.) for a maximum ROI.